Tom Harris MP: "I told Gordon I don't think the public will change their mind about him"
Gordon Brown has faced his Labour critics after another minister quit with a blast at his leadership. Environment minister Jane Kennedy said she could not support him as leader. It came as Labour digested a dire set of European election results which saw them gain just 15% of votes and finish behind the UK Independence Party. At a meeting of the Parliamentary Labour Party (PLP) Mr Brown was applauded by most MPs despite admitting doing some things "not so well". 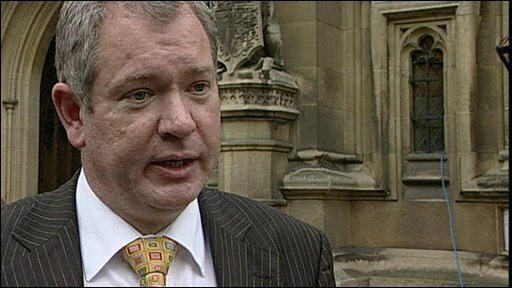 At a separate meeting, former cabinet minister Stephen Byers called on the prime minister to resign. The meeting of the PLP had been billed as crucial for Mr Brown's efforts to remain prime minister. During it, Charles Clarke, a former home secretary, told the prime minister he should quit, as did MPs Fiona McTaggart, Tom Harris and Siobhan McDonagh, the BBC understands. But BBC political correspondent James Landale said MPs, crammed into the committee room, cheered and banged desks in support of the prime minister. Defence Secretary Bob Ainsworth said there had been "no support" for the rebels who spoke and the meeting had been "overwhelmingly" supportive of the prime minister. According to his spokesman, Mr Brown told the room he had "strengths and weaknesses" and that there were "some things I do well and some things not so well". Another ex-home secretary, David Blunkett, also told the meeting the rebels should "put up or shut up", the BBC has been told. Backbencher Barry Sheerman - who had previously called for a debate on the leadership - said he had expressed his own reservations about Mr Brown, but had been won over by his pledge to consult more and be more transparent. Mr Sheerman added: "If the prime minister sticks to what he says, those of us who have been his critics will stand down for the time being." Ever since James Purnell's dramatic resignation from the cabinet there has been what one of those working to unseat the prime minister describes as "a battle of the bodies". Conservative leader David Cameron said Mr Brown and his critics were locked in "a slow dance of political death". "He can't seem to reshuffle his cabinet but they can't seem to organise a coup," he told Tory activists in Wales - where the Conservatives pushed Labour into second place in the European elections. A ComRes survey for the Independent suggests Alan Johnson would cut Mr Cameron's advantage if the new home secretary were to become Labour leader. It said the Tories would lead by 38% to 22% with Mr Brown at Downing Street, but with Mr Johnson at the helm Labour's support would rise to 26% and backing for David Cameron would fall to 36% - enough to deny the Conservatives an overall majority. Mr Brown has been reshuffling his junior ministers, following last week's cabinet reshuffle and departure of six cabinet ministers and several other ministers. Part of that process has seen the departure of Ms Kennedy, Liverpool Wavertree MP, who has quit the government before - as health minister in 2006 over NHS reforms. Let's hope that we are entering a new age; one in which Labour can be consigned to the dustbin of history. She told the BBC: "I was asked if I wanted to stay in government and if I did, would I give an assurance that I would be in support of Gordon Brown? "I wasn't able to give them that assurance and therefore I have not been reappointed to the government." Mr Brown's spokesman said the prime minister "did not ask for any pledge of loyalty from her or any other minister". Meanwhile, Mr Byers told the meeting of the Progress thinktank that "now is the time for Gordon Brown to stand down" if Labour were to avoid a "humiliating defeat". Labour MP Sally Keeble also announced she was withdrawing her support for Mr Brown in a letter to her constituents in Northampton North. Later she told the BBC Mr Brown had not been able to "command authority" within government. Labour MP Frank Field, the leader of last year's 10p tax rebellion, accused Mr Brown's allies of trying to "terrorise" Labour MPs into sticking with him by the threat of an immediate general election.